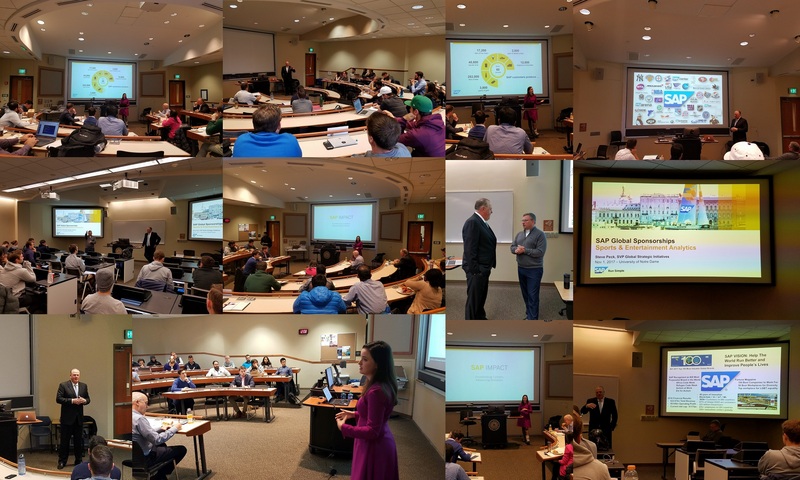 On Wednesday November 1st, visiting SAP Executives Steve Peck and Mary Carol Madigan met with University of Notre Dame students to share business and career information in classroom and career sessions. Steve Peck is SAP Senior Vice President of Global Strategic Initiatives. Reporting to SAP’s President of Global Customer Operations, Steve serves as a proxy for the President where needed and drives strategic programs and partnerships focused on accelerating customer value and innovation. He recently launched SAP’s Sports and Entertainment industry globally delivering innovative industry solutions and providing a platform to showcase the SAP Brand on the world’s biggest stage. He spoke with two different graduate and undergraduate “Sports Analytics” classes in the Mendoza College of Business to share our perspective on the exciting business and technology revolution in sports. Steve described a wide variety of SAP innovative solutions that serve the sports industry. We were hosted by Dr. Scott Nestler who teaches several analytics and business intelligence courses at Notre Dame. We were joined by recent Notre Dame graduate Mary Carol Madigan for an InfoSession with Notre Dame MBA students over lunch. Mary Carol recently completed SAP’s unique IMPACT program and currently serves as a Machine Learning Strategist in one of our key exponential technology groups. Mary Carol shared her personal career journey, explained the elements of our IMPACT program and answered questions. Steve Peck added his perspective about careers with SAP and some valuable leadership advice for the students. It was a very lively discussion and I am pleased to report that we have a very large and strong applicant pool of MBA students for SAP positions thanks to this meeting and other career events on campus.